NEWINGTON - One of many hopefuls in the 2018 gubernatorial race recently visited a small but mighty Newington manufacturer. Democrat Sean Connolly of Hebron, who announced his candidacy in December, came to Frasal Tool at 14 Foster St. 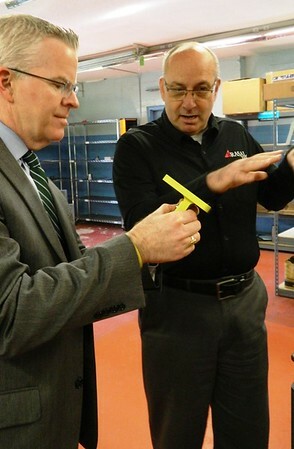 He visited the 45-year-old company’s 10,000-square-foot facility as part of his jobs tour. A lieutenant colonel in the U.S. Army Reserve and an Iraq War veteran, Connolly spent seven years on active duty. He then worked at Pratt & Whitney, eventually becoming the company’s Global Ethics & Compliance Officer. He most recently served as the state commissioner of the Department of Veterans Affairs. Connolly met with Vice President Paul Giangrave, the founder’s son, and other company leaders. “With the questions we asked, he seemed to be very energetic about helping manufacturing,” added Frank Giangrave, his brother and the company’s general manager. They were joined by estimator and process planner Mike Budynkiewicz, who offered Connolly some insight into working in the manufacturing industry and the toolmaking sector in particular. An East Hartford native, Connolly is the son of an Irish immigrant who started a small landscaping business. He and Giangrave found common ground in their family backgrounds, having raised by fathers who taught them the importance of hard work. “My father started this company in the 1970s out of a two-car garage in New Britain,” Giangrave told him. He went on to ask the candidate how he might consider helping small manufacturers in a state with a difficult business climate. “What can you do to incentivize for companies to stay here?” he explained. Connolly said his proposals include investment in the small business sector, college loan forgiveness for trade school graduates who decide to settle in Connecticut and income tax credits for first-time homebuyers. Erica Schmitt can be reached at 860-801-5097 or eschmitt@centralctcommunications.com. Posted in New Britain Herald, Newington on Wednesday, 7 February 2018 21:38. Updated: Wednesday, 7 February 2018 21:40.